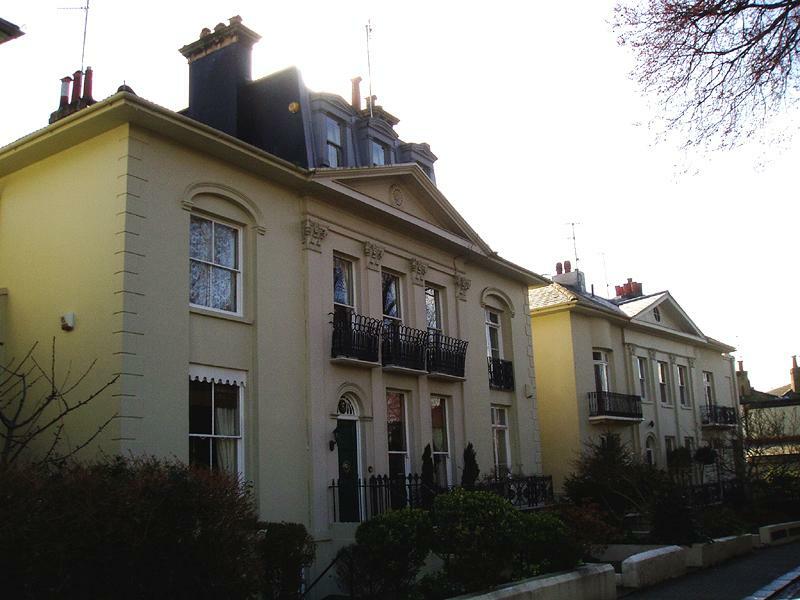 Amon Henry Wilds, perhaps Brighton’s greatest architect, was employed by an entrepreneur called Henry Brooker in 1814 to create Hanover Crescent, a series of grand linked houses, built to look like eight large villas. On closer inspection, six of these contain three houses, one contains two, and the last contains four, making a total of twenty-four Grade II listed houses. The buildings do not form a unified composition although they do share features such as shell motifs, bow fronts and Wilds’ characteristic Ammonite pilasters. The crescent was completed around 1822, the year in which the Level was formally laid out to the west. All of the buildings have two storeys with a lower ground floor and some have attic rooms (some added unsympathetically). The two single-storey buildings that flank the crescent (North and South Lodges) are also listed, as is the brick-edged flint garden wall. Interestingly, the Brighton Improvement Act of 1884 led to the garden being taken over by Brighton Corporation. Famous former residents include novelist Horace Smith who lived at No. 10 in 1826-40, and Sir Rowland Hill, the originator of the penny post and chairman of the London and Brighton Railway Company who lived at No. 11 in 1844-6. Wilds also designed Park Crescent, on the north side of the Level, which is another pleasing architectural composition and certainly a future column topic. Hanover ward was first designated in 1894 and covered the area between Lewes Road, Elm Grove, Queen’s Park Road and Southover Street. Fortunately, the very attractive terraces of small rendered properties with rectangular windows have escaped the massive development that has taken place across the city. This densely-populated area was developed from about 1860 although the nearby Percy Almshouses, at the bottom of Elm Grove, were erected in 1795. The ward is now called Hanover & Elm Grove and has expanded to include land up to Bear Road and Brighton General Hospital. Hanover was designated a ‘general improvement area’ in 1969-76 and has become a very fashionable place to live. As the crescent is separated from the road by mature gardens and a wall, it really is possible to imagine being in Regency Brighton, though the traffic noise and parked modern cars do give the game away slightly. One of these exquisite villas was recently put on the market for £675, 000 with Strutt & Parker. It looks like I had better get saving!